The Frances C. Poage Map Room contains over 17,000 historic and contemporary maps, a cartographic reference book collection, map indices, and related archival items. The Frances C. Poage Map Room was established by an Endowment during the 1980s by former Congressman W. R. 'Bob' Poage in honor of his wife, Frances C. Poage. The Endowment enables growth of the map collections by providing funding for additional cartographic holdings. Patrons are welcome to use the Poage Map Room, and those interested should be prepared to follow the Reading Room Policy. Congressman Poage taught geology classes at Baylor University during 1922-1924 while attending Baylor's law school. His political career as the U.S. Representative of the Texas 11th District spanned a 50-year period from 1937 to 1987. Poage's knowledge of political, geographical and geological features of virtually every country in the world was well-known. A lifelong lover and collector of all kinds of maps, the Poage Collection spans the years from the 1920s to the 1980s. 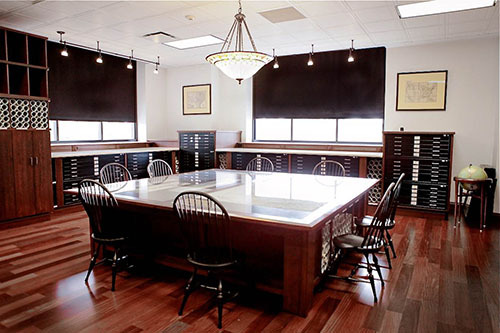 His deposited collection of topographic maps, along with acquisitions from the Endowment, is housed in the Frances C. Poage Map Room in The Texas Collection on the Baylor University campus. Additional maps are deposited with his political papers at the Baylor Collections of Political Materials .